This article is not directly related to NS Recipes, but about editor integration and configuration. You can do a lot of cool stuff with editors. 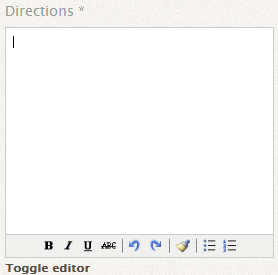 NS Recipes supports (at least) tinyMCE, CK and JCE editors. The main point of this section is to restrict editor options to prevent your users from getting access to too many options while submitting recipes. TIP: To the best of our knowledge, CKEditor shows more responsiveness than other editors. On top of that, it is free. 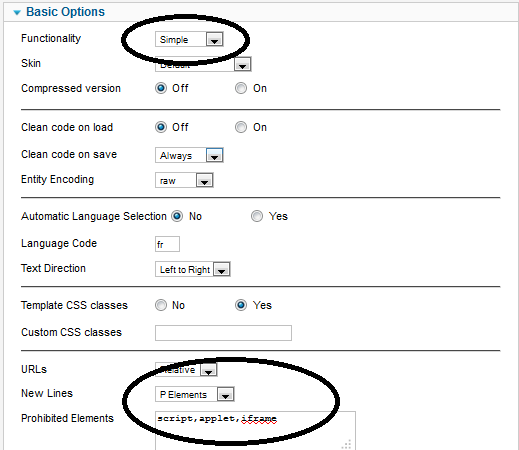 Select the Simple functionality, make sure the "New Lines" option is set to paragraphs elements (P elements) and that Prohibited elements filters script, applet and iframe (for security reasons). Save. Info: Regardless of the editor you use, please report to its documentation to make the most of it.